Kirk Bell September 25, 2017 Comment Now! It’s the very antithesis of Porsche. Or is it? The Cayenne, an SUV, is the sports car company's second best seller, behind another SUV, the Macan. It may be an SUV, but it’s still a Porsche and that means it has to be sporty. Porsche is introducing the third generation of the Cayenne for the 2019 model year, and this one promises to be the sportiest and roomiest yet. Performance with utility? Doesn’t seem very Porsche, but in a world in which two SUVs lead the way for a sports car brand, that’s the reality. To see just how Porsche is improving its third-generation Cayenne, I traveled to Düsseldorf, Germany for an in-depth technical backgrounder on what makes this mid-size SUV tick. The following is what I learned. 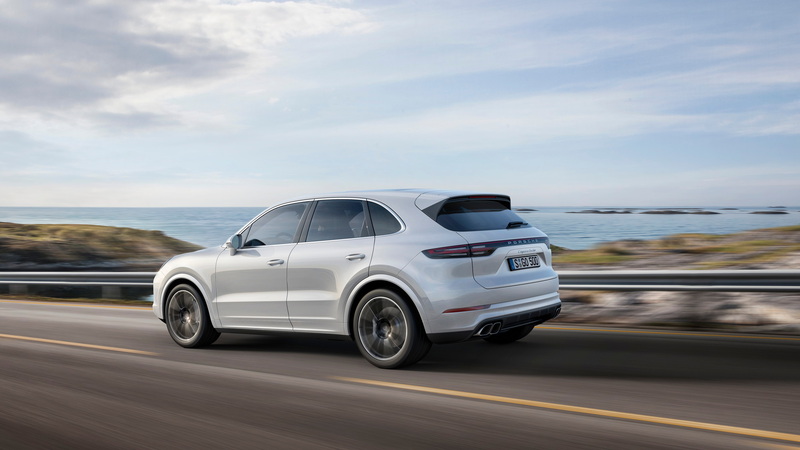 The 2019 Porsche Cayenne is based on the Volkswagen Group’s MLB platform that provides the basis for the Audi Q7. The Cayenne is shorter and lighter than the Q7 and has two rows of seats instead of three, but the basic architecture is shared between the two vehicles. Compared to the outgoing Cayenne, the new model is 2.5 inches longer, 0.9 inches wider, and it sits 0.35 inches lower. The rear cargo area also has 15 percent more capacity, and the wheels and tires are wider and larger. The new body in white employs a multi-material mix strategy that features various types of steel and aluminum. The roof, side panels, doors, tailgate, hood, and fenders are all made of aluminum, as are various parts of the unibody structure. All told 47 percent of the body in white is aluminum, and the body saves about 74 pounds versus the outgoing vehicle. This is despite the fact that 110 pounds were added to the structure to help the Cayenne pass the IIHS’s small front overlap crash test. Porsche also employs numerous joining technologies to make steel work with aluminum and to give the body rigidity. The body components are joined in more than 6,300 spots—6,800 robots are used to put them together—and more than 160 meters of adhesives are used in the process. As a result of the joining processes and the materials mix, the body’s static and dynamic stiffness are both improved by about 20 percent. Aerodynamics play an important role in both the efficiency and performance of the new Cayenne, with the Turbo model benefiting most from the performance upgrades. The 2019 Cayenne gets an expanded active air-shutter system up front, and it now has an active roof spoiler on the Turbo model. The front air shutters are now not only found beneath the upper grille, but also the lower grille and along the sides. Those side shutters are vertical while the rest are horizontal. The spoiler of the Cayenne S model is 1.8 inches longer than the previous one, while the trailing edge of the spoiler on the Turbo model is lowered 0.65 inch. However, the Turbo's spoiler can extend up to 3.2 inches upward. The shutters and spoiler work together on the Turbo in a system called Porsche Adaptive Aerodynamics to provide the best cooling and aerodynamics for performance purposes. The active rear spoiler has five positions, and the shutters are deployed based on the need. In the Eco setting, the spoiler remains retracted and the front shutters are closed at speeds of up to 100 mph for best aerodynamics. Above 100 mph, a Performance mode is activated in which the spoiler automatically extends upward 0.8 inches and the vehicle’s ride height is lowered 0.7 inches. In Sport+, the front shutters are fully open and the spoiler extends to 1.6 inches to provide more downforce, but the spoiler will automatically retract if the vehicle is traveling over 124 mph because it would provide too much drag at that speed. The spoiler creates 242 pounds of downforce at the Cayenne’s max speed of 178 mph. If the panorama roof is open, the spoiler extends to 2.4 inches to compensate for the airflow over the roof. The fifth position is called Air Brake. It is activated if the vehicle is traveling at more than 106 mph and the system detects heavy braking such as in a panic stop or during track driving. The Air Brake position will help the Cayenne stop two meters shorter from 155 mph. The Cayenne may be based on a platform shared with Audi, but it had to meet Porsche criteria. Namely, it had to have optimal driving dynamics and steering precision; performance brakes and high-performance tires; the highest level of functional spread between performance and fuel consumption, as well as dynamics and comfort; plus offer optimal efficiency within these targets. The MLB platform marks a switch from a double wishbone front suspension to a multi-link MacPherson strut assembly that makes copious use of aluminum. While double wishbone suspensions are considered premium, the Porsche engineer I spoke to said the new geometry brings the virtual steering axis closer to the body, and therefore provides better wheel isolation, which results in a smoother ride and fights against issues like bump-steer. BMW has used this type of assembly successfully for decades. All Cayennes will feature Porsche’s Hang-on all-wheel-drive system that runs with a rear bias as much as possible most of the time (especially in the Sport and Sport+ driving modes), but can send all of the power to the front or rear wheels when slip is detected on either axle. The system uses an electronically controlled wet multi-plate clutch for active transfer of torque to the front axle. The Cayenne also moves to staggered tire sizes, which allowed engineers to concentrate on optimizing the rear tires for acceleration and the fronts for steering instead of compromising both. Wheel sizes have also grown to 19s for the base model (from 18s), 20s for the S (from 19s), and 21s for the Turbo (from 19s). The tires are Michelin Latitude Sport 3s, and tire sizes are as follows: the Cayenne has 255/55R19s up front and 275/50R19s at the rear, the Cayenne S comes with 275/45R20s at the front and 305/40R20s out back, and the Cayenne Turbo sports massive 285/40R21s up front and 315/35R21s out back. The base springs are steel, but an improved three-chamber air suspension will be optional and standard on the Turbo. It comes with electronically adjustable twin-tube dampers, and its three chambers allow it to be both softer at one end of the damping spectrum and firmer at the other than the outgoing system. 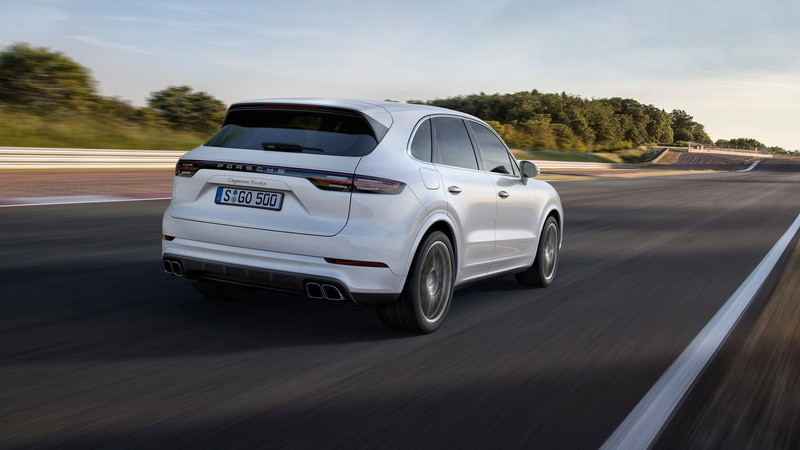 At the rear, buyers will be able to opt for rear-axle steering that turns the rear tires up to 3 degrees out of phase with the fronts at speeds below 50 mph to help the Cayenne rotate through turns and with the fronts up to 1.5 degrees above 50 mph to provide highway stability. The steering ratio is a quick 13.3:1, and it gets even quicker at 12.2:1 with the optional rear-axle steering. By comparison, the Q7 is 15.8:1 standard and 13.3:1 with its rear-axle steering system. 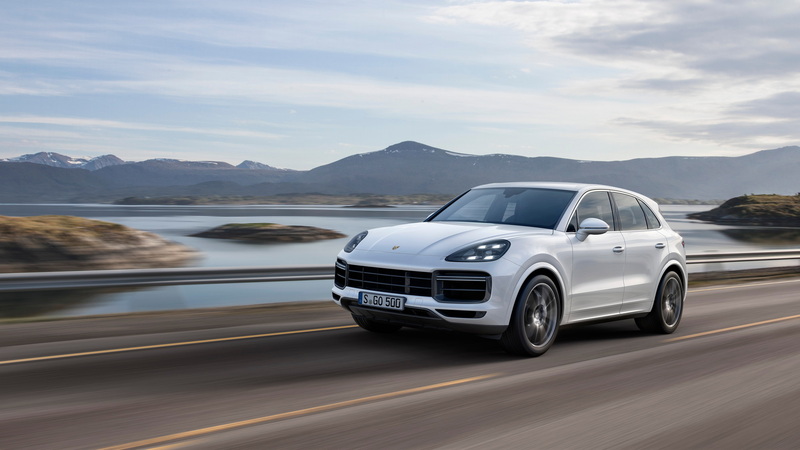 Between the mixed tires, the steering ratio, and the suspension, Porsche claims the new Cayenne has greater responsiveness and precision, as well as better straight-line feel. We'll report on our take when we drive it in a few weeks. Porsche will offer two more suspension technologies as options. The Porsche Torque Vectoring Plus (PTV Plus) system has an electronically controlled rear differential that uses a wet multi-plate clutch to apportion the torque to the outside wheel in a turn, then lock up the wheels as the vehicle straightens out for optimum performance, driving stability, and traction during performance maneuvers. Also on offer will be the Porsche Dynamic Chassis Control (PDCC) electromechanical roll stabilization system. This version is now a 48-volt system, so it reacts quicker than the last one. It amounts to active anti-roll bars front and rear that can be made stiffer or softer by applying positive or negative tension to them via a swivel motor. Tense up the bars and they help keep the Cayenne flatter in a corner. Soften them up, and they let the wheels droop more for better off-road articulation and traction. All of these systems are integrated via the 4D Chassis Control system, which also works with all the systems to make the Cayenne work best off road. It adjusts the throttle, traction control, transmission, diff locks, ride height, spring rates and dampers, PDCC, and rear-wheel steering to optimize the vehicle for four different off-road modes (Gravel, Mud, Sand, and Rocks) and four different chassis heights (Low, Medium, High, and Terrain). The base ride height is 7.5 inches and the top ride height is over 9.6 inches. The 2019 Porsche Cayenne will be offered with four different brake packages. The base setup consists of 13.8-inch front and 13-inch rear rotors. Cayenne S models get 15.3-inch mm front and 13-inch rear rotors; those fronts are 1.2 inches larger than those they replace. Standard on the Turbo and optional otherwise will be the innovative new Porsche Surface Coated Brakes (PSCB). These iron brakes feature 10(! )-piston front calipers and 16.3-inch front rotors and 4-piston rear calipers that clamp 14.4-inch discs. The calipers are white, and all four discs are coated with a tungsten-carbide mixture that is essentially burned onto the surface using a high-velocity oxygen fuel. This creates a hardened surface that is 100 microns thick. While 100 microns represents the usable surface of the rotors and is considerably thinner than the 1 mm of material that is usually used on iron rotors, Porsche says it is good for at least 30 percent more wear and perhaps up to twice as much depending on driving style. The PSCB brakes have other advantages as well. They create 90 percent less brake dust than standard iron brakes because the surface is so hard. The coating makes them corrosion free, and in fact creates a mirror-like finish when the surfaces are burnished in by the special pads they require. From a performance standpoint, these brakes are more fade resistant than iron brakes because they don’t heat up as easily, which should translate into excellent performance on a racetrack. It should be noted that these brakes will have a black layer on them after a spirited session on a track, but the surface will return to that mirror-like finish after a short time on the road. Pricing is already out for these brakes and they cost $3,490 as an option for the Cayenne or Cayenne S.
Above the PSCB brakes are the $9,080 Porsche Ceramic Composite Brakes. These have 17.3-inch front discs and 16.1-inch rear discs with the same calipers as the PSCBs. They are 0.8 inches larger than the carbon-ceramics from last year, and they weigh 53 pounds less than the PSCBs. 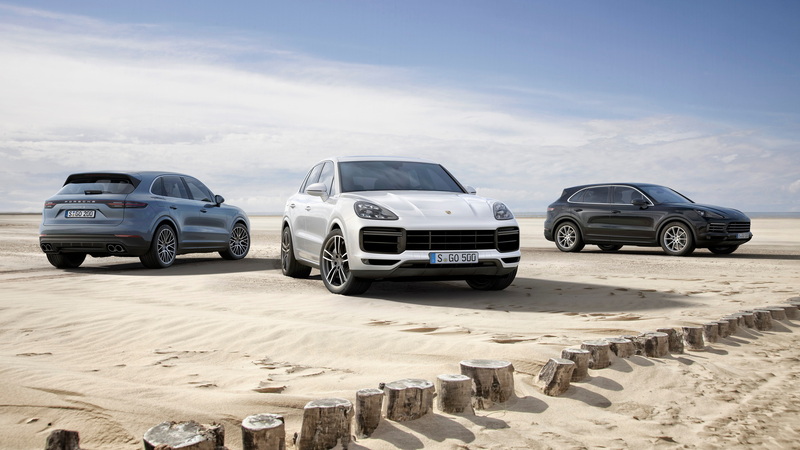 Porsche is upgrading the engines in all three of its Cayenne models, and all three engines are related. The base engine is the 3.0-liter turbocharged V-6 that you’ll find in the Audi SQ5, S5, and S4. In the Cayenne it produces 340 horsepower and 331 pound-feet of torque. It replaces the Volkswagen-derived 3.6-liter VR6 V-6 that made 300 hp and 295 lb-ft of torque. 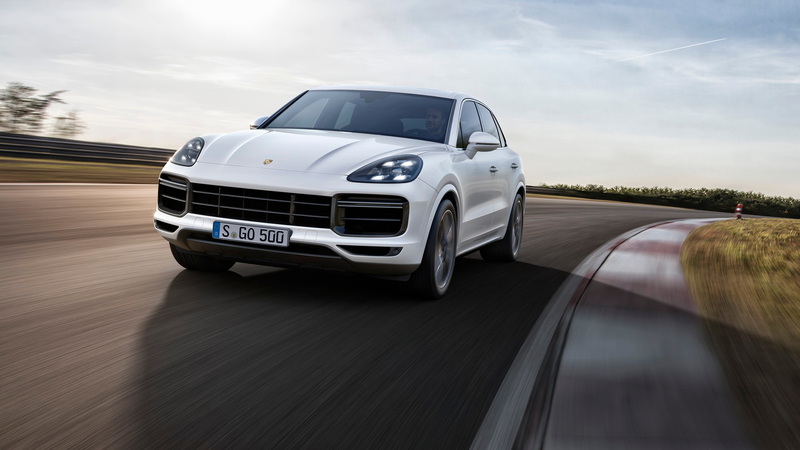 The new 3.0 can launch the Cayenne from 0 to 60 mph in 5.9 seconds—when equipped with the optional Sport Chrono package, that figure falls to just 5.6 seconds. Stepping up to the Cayenne S nets you a twin-turbocharged 2.9-liter V-6 that spins out 440 hp and 404 lb-ft of torque. It’s basically the same engine as the 3.0 but with a shorter stroke and an additional turbocharger. It replaces a twin-turbocharged 3.6-liter V-6 and outdoes it by 20 hp, but is down by 2 lb-ft of torque. It propels the Cayenne S from 0-60 mph in 4.9 seconds without Sport Chrono and 4.6 seconds with it. At the top of the lineup is a new twin-turbocharged 4.0-liter V-8 that has also shown up in the Panamera. Both the twin-turbo engines have their turbos in the “hot V” between the cylinder heads where the path of the airflow is shorter for quicker response. This engine puts out 550 hp and 567 lb-ft of torque. Those numbers reflect improvements of 30 hp and 14 lb-ft over the model it replaces. The 0-60 mph time? A mere 3.7 seconds with or 3.9 seconds without the Sport Chrono Package. All three engines are mated to an 8-speed automatic transmission sourced from ZF. Seventh and eight gears are overdrives, and the transmission has Comfort, Sport, and Sport+ shift settings. The Hang-on AWD model is integrated into the transmission, directing power to the front wheels when needed. All Cayennes also come with automatic stop/start that can switch off the engine while coasting to a stop at speeds of about 4 mph and below. Porsche made sure the powertrain could handle a variety of tasks. It can tow up to 7,700 pounds, ford up to 19.7 inches of water, and maintain oil pressure while climbing a 45 degree hill for 98 feet. The 2019 Porsche Cayenne certainly looks promising. It's down by up to 143 pounds versus the last model, offers several new or improved chassis technologies meant to improve handling, and has an all-new engine lineup that promises more power and efficiency. We'll see how all these improvements affect the driving experience soon, but we expect this sporty SUV to be even sportier as well as roomier, and that bodes well for Porsche's second-best selling vehicle. Porsche provided travel and lodging to Internet Brands Automotive to bring you this report. Correction: A previous version of this post listed 0-60 times for Sport Chrono-equipped Cayennes, but used the times for non-Sport Chrono-equipped cars. This has been corrected. The story now includes both Sport Chrono and non-Sport Chrono times. Also, this post said the second-generation Cayenne used a 7-speed dual-clutch automatic, when it actually used an 8-speed Tiptronic automatic, like the new model. We've removed the reference to the 7-speed transmission.